I have another card today using Tammy Tutterow Design products. I really like how this one turned out! I started with a piece of kraft cardstock, and stamped the Big Woodgrain in brown ink. Then I turned the panel over and scored 5 lines vertically to create planks. I used ground espresso ink to darken my score lines, which were now pushed out on the front of my panel from the scoring. This panel was attached to a piece of craft foam and glued to the front of my card front to lift it up a bit. Next I cut out my leaves and flowers, distressing the flowers with gathered twigs on the edges, and bending the petals inward, and then attached them together in layers with brads. These were arranged onto my plank background and glued down. To finish I cut one of Tammy's Frayed Tabs, stamped my sentiment, and then recut the tag to center the sentiment on it. I find this sentiment a good one when I want to send out a card "just because", not for any particular occasion. I hope this inspires you to do the same! I can NOT get enough of this cardinal! Here's a quick and easy design for Christmas, especially if you have the matching dies. A little hint for Christmas, or for that matter, whenever you have a stamp that you adore: while you're stamping one of them, you may as well do a whole page full! The mini Misti makes that pretty simple nowadays! Store them right with your stamp set, then you can cut them out as you need them. 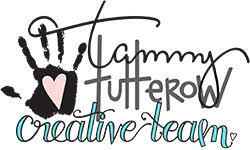 I have another Tammy Tutterow cling stamp to show you today! This big bold sentiment is all you need for the front of a card, and you can be as fancy or as simple as you like when you color it in. I made this one monochromatic. Tammy's cling stamps are perfect for people like me who like to color but don't own a million markers. Here I just used 4 of the Spectrum Noir yellows to give a slightly ombre effect on the "Sunny" part of the design, and then each other word was colored with a different yellow. To finish, I stencilled a large gingham pattern over the whole panel. A simple black frame brings out the black outlines, and you're done! We have 2 special Davids having birthdays this month, a cousin and a good friend. They usually get something with fall leaves, but this year I'm using the gorgeous Birch Tree Window die for their cards. This first one is for my cousin, an avid hunter and also a missionary to Africa. He's home on leave this year, so his card will get to him in a timely fashion for a change! I thought this abstract leaf pattern would make a fun background to showcase the birch window. I simply added a sentiment die, and squared off the birch tree with a scalloped rectangle. No fuss, perfect for a guy! Thanks for coming by today - hope your week is going well! 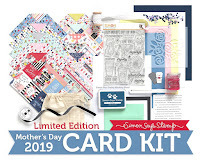 If you're here to see my cards for the Hero Arts Hostess Reunion blog hop, please scroll down a post or click HERE. 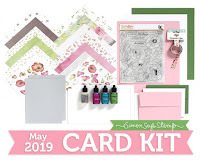 Our theme this week is your favorite Anything Goes, and my teamies and I are playing with Lawn Fawn goodies! I made 2 cards for the season, both of them using Lawn Fawn plaids and stamps. Hero Hostess Reunion Blog Hop! Welcome to Day 2 of our Hop, featuring stamps from the new 2016 release and Winter Catalog! From 2009 - 2012, Hero Arts put together classes of 4 to 8 "Hero Hostesses" for a 4-month term. Our job was to make people feel welcome in the Hero Arts Flickr group, and to contribute our work using Hero Arts stamps. There ended up being 36 of us before the program was discontinued, and as we were a kind of crafting sorority, we coined "sista" as the name we called each other. I treasure these ladies, and have a soft spot in my heart for each of them and Hero Arts. I am so excited to be reunited with my Hostess sisters again this year, and I thank Hero Arts for enabling this reunion! You should have arrived here from the amazing Kathy Racoosin's blog. If you want to start from the beginning of today's hop, just visit the Hero Arts Blog to get our lineup. I love their birds this year, so I chose 2 bird sets, Vintage Christmas Post and Color Layering Cardinal, and made 2 cards with each set. I love the faint script in this set and stamped it randomly all over my panel before adding my other elements. I used my mini Misti and Jennifer McGuire's tutorial for mirror stamping to make a 2nd cardinal, and then colored them as a male and female. We always see cardinal couples together at our feeders, and they add such lovely color to our dull winters! My 2nd card with this set is much more CAS in design. I paired it with one of my all-time Hero Arts sentiment sets, which is sadly retired. When you listen to cardinals outside, "Cheer, Cheer, Cheer" is one of their songs, so I thought this sentiment was a good one. My next cards use the fabulous Color Layering Cardinal. Isn't this multi-step stamp amazing? And it's not hard at all to line everything up. I used 3 different red inks and my misti to stamp him, then fussy-cut him and set him aside. Starting with a white card folded at the top, I trimmed and added a blue watercolor wash design paper. Next I embossed a piece of acetate with the snowflake folder, trimmed it, leaving about an inch at the top, scored it close to the design, and then secured it to the card with double-stick tape on the back. To finish I cut the pine branches and stamped and trimmed my sentiment, and added them to the front of the card over the acetate. And lastly the cardinal was popped above everything else, and I sprinkled on a few sequins for sparkle. I think this sentiment would work for all seasons, not just for winter/Christmas! I liked the way the snowflakes looked with him, so I made another card using the same embossing folder, and this time I used more of the accessory stamps in the set, and added a woodgrain panel. Hero Arts is offering TWO $25.00 shopping sprees to our hop readers! One will be chosen from those who comment on the blogs along yesterday's hop and one from those in today's hop, and there will also be a bonus prize chosen from comments left at the Hero Arts blog on each day! The more commenting you do, the better your chances - deadline for commenting is Sunday, Oct. 30, by 11:59 pm Pacific time. 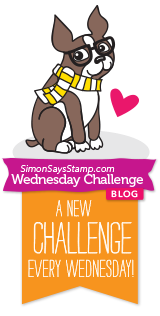 Now it's time to hop on over to my friend Linda Wetterlin's blog - I know you'll love what she's made for today! 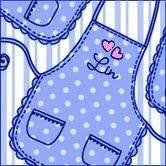 Lin Brandyberry - that's me! I received my November Card Kit from Simon yesterday and got right to playing! I've been loving wood plank design papers, and was thrilled that one of them was in the kit. I trimmed it to A2 card size, embossed it with the included folder, and then lightly used the ink pad to add color to the raised parts. The little cube is perfect for doing this. The panel was mounted to a card base, and then I stamped the sentiment with VersaFine ink and embossed it to keep it from smearing on the copper panel. I also die-cut a circle from the same copper to insert inside the flower clip, and that's where I added some adhesive to make it stick to the card. I photographed my card with the beautiful copper metallic envelope that is also included in the kit. Tammy, you had me with the heart and flowers! and isn't that tiny sentiment at the bottom right adorable where she placed it? I simply water-colored this, splattered some left-over spun sugar distress water, and added 2 of my favorite things: gingham and buttons! 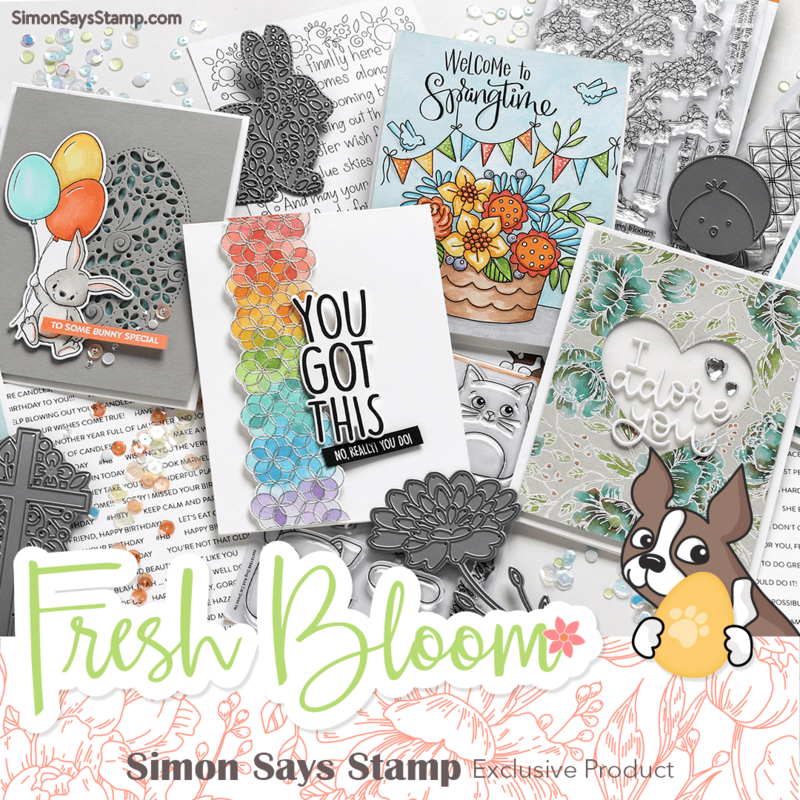 Simon Says Stamp has a new release debuting today! The release is called "Believe in the Season". The sentiment die is inlaid, and the new Northern Lights one is glued onto the blue glitter cardbase. I just added a single silver sequin to the center of the large snowflake. Easy but this packs lots of glitz! 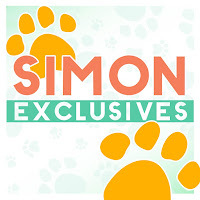 Be sure to visit Simon today to see the other new things that are being released! I kept this design simple - just white embossed 2 of the butterfly stamps, plus an appropriate sentiment right onto a pink ombre design paper, then trimmed it, and added the panel to a white card base, along with some sparkly sequins. My next card uses the largest butterfly from my set, along with some dies cut from a pink metallic sheet. Still playing with Tammy's goodies - this time an embossing folder, a background cling stamp, and some more of her posies dies. I used 2 layers of 2 of the flowers in this set, and edged them all with ink before rolling the petals a bit and attaching them all together with a brad. The next one looks a bit more modern. The background here is an embossing folder. It could be cracked paint, or bark. I used all 4 flowers in this set, gradually stepping down the color as the size decreased. For the background, after embossing, I simply swiped with old paper distress ink. Here's a card using one of Tammy Tutterow's cling stamps. I don't make many rainbow cards, but this colorway seemed the way to go for my first play with this stamp. 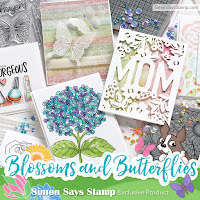 How to's: Stamp and clear emboss stamp, trim with scallop die, color in letters and flowers. On card front, use stencil to add stripes; adhere scalloped panel to card. We're having an Indian Summer here - enjoy! I'm not one to do much for Halloween except hand out candy on the day, but, when it comes to grandkids, I make an exception! I wanted to share the cards I made for our grandsons for Halloween. Our granddaughter will get THIS one. My first card today is for our 7-year old. I masked off the center of my card, and then, using my mini Misti, I first positioned the 3 pumpkins, and then the various sentiments to fill in the space. The Misti made doing this pretty easy - I was able to line up everything without any drama, even stamping several sentiments at a time! I'm beginning to play with Tammy Tutterow's wonderful products - here is a card mixing one of her cling stamps with some of her floral dies. I cut the flower 3 times, embossed it, and sponged it with some coral distress inks, then separated the layers with adhesive foam squares. 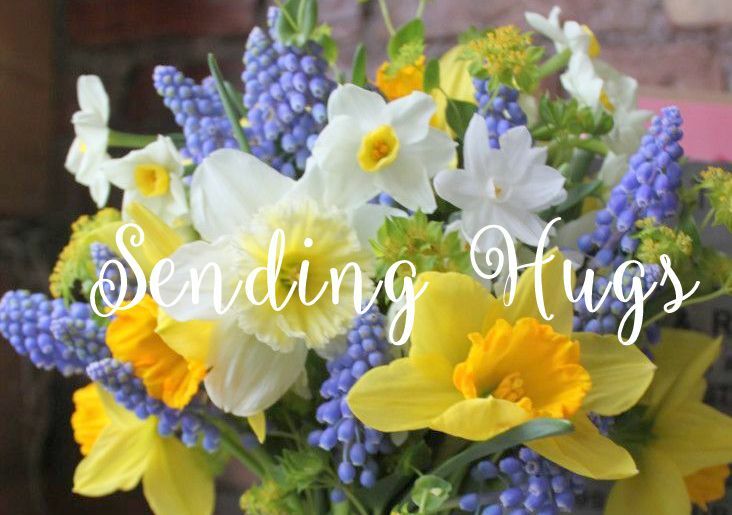 Hope you're enjoying this beautiful day! I recently received Hero Arts Color Layering Cardinal and wanted to make a card to enter into their Holiday Cardmaking Challenge. I have always loved clear cards, so that is where I started. I started by stamping some pine sprigs in various green and broken china distress inks onto watercolor paper, then spritzed them with water slightly to blend the colors and let them run into the white spaces. When dry, that panel was trimmed and affixed to a white card base. I then stamped the snowflakes onto an acetate card using Stazon white ink and inserted the watercolor card underneath, using double-stick tape on the back to hold them together. To finish I stamped and fussy-cut my cardinal, and added him along with my die-cut and stamped sentiment. 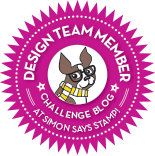 It's really easy, especially with my Mini Misti, to line up the various layers for this gorgeous stamp! This challenge runs from now until November 15, and there are FIVE $50.00 shopping sprees with free shipping up for grabs!! 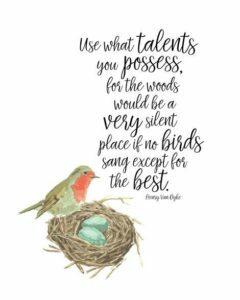 This week, our theme is "Totally Resistable" - use some kind of a resist technique for your creation. We are showcasing Impression Obsession products. I bought this stamp set just for the sentiment I used......Autumn Leaves is a song that is dear to me, not only because of this season that I love, but because it's the theme song for our Bluecoats drum and bugle corps. I had made this board background some time back and never used it, but I liked how the copper embossing looked against this color. To make this background, I stamped the woodgrain stamp in a dark brown ink on white cardstock. Next I turned the panel over and scored lines to make the planking. And finally, I used a mix of blues, greens, and browns distress inks to shade over the woodgrain. The leaves were then embossed in copper over that. To finish, I stamped the sentiment on vellum, framed it in copper cardstock, and popped it above my card base. The little leaf was also fussy-cut and popped above its panel. After stamping and clear heat embossing the sentiment, I trimmed my panel and then die-cut the leaves in a cascading design. They were sponged with various distress inks. Next I sponged the background using fossilized amber and carved pumpkin inks and used the negative of the die to stencil more leaves along the diagonal. Then I reinserted the leaves, popping up 4 of them (1 of which was embossed in an enamel), and adding some matching sequins. I divided my panel into quarters, and then started at the center, stamping each letter separately to build my sentiment. Then I diluted my distress inks very slightly with water and sloshed them on the tiles, not trying to keep anything "in the lines". I splattered the leftover puddles on my panel after I was finished painting, let it dry, and then stamped the rest of the sentiment in black. The sky's the limit with this set, especially for when you can't find just the right sentiment. And it makes a great option for masculine cards, too - simple and to the point! Thanks for coming by today - have a great week!